Original 1978 Kenner “Star Wars” action figure display stand. No time for a wacky intro; head straight to the photos! Big Rob brought in boxes and boxes of oodles and oodles of goodies. The colorful boxes, as you can probably tell, are various Hot Wheels and Johnny Lightning collections and race sets. The beige bombers in the background are chock-full of many, many, many individual HW and JL models in MoC condition. I see about a dozen reasons you should attend Suncoast Diecasters meetings. While the vastly overwhelming majority of Big Rob’s collection are of course 1/64th-scale, one particular box held these footlong-plus behemoths. These are RC versions of Sweet 16 II and Twin Mill. Yes, he has the controllers also, in case ya wants ta race ’em. These are actually larger than a Fiat 500. Of course I did. You and Suncoast Diecasters have been seeing each other for about twelve years now. So of course I did a special favor for you. Enjoy. Click below for special favor. Bill bought two vehicles from Big Tractor Mike. First is this 1983 Fork Lift Truck, which is based on a Lansing Bagnall model. Buy our fork lift with “Up” feature, and get our exclusive “Down” feature at no extra cost! Next is this Mercedes-Benz Container Truck from 1981. This version also has dark-tinted blue windows. Room for plenty more rubber bands inside! Not to be outdone (though clearly outmatched) in the “bigger than 1/64” department, Tom bought this gorgeous Rolls Royce Silver Shadow from BTM. This is MebeToys model A-26 from Gran Toros. This beauty doesn’t just get by on looks alone. It also features an opening bonnet (with some rigging), opening doors and an opening boot. If you look closely, you’ll even see gauges on the dashboard. Well, well, what have we here? Why, it’s a reproduction of Alan Nash & Co.’s patent for Hot Wheels track connectors. You didn’t know those purple connectors had over four hundred moving parts, did you? Oh, and look: it’s Larry Wood’s original sketch for Tri Baby. If this doesn’t make a toy car collector drool, I don’t know what will. I mean, beside pizza. Whence come this intriguing images? They’re just two of several dozen such illustrations and photos in this wonderful book, Hot Wheels: 35 Years of Power, Performance, and Attitude. This is how our April meeting started, with Big Rob RAOKing this to Big Tractor Mike. For a host of reasons which should be obvious, I easily declare this book to be Suncoast Diecasters‘ Find of the Month(*) for April 2018. Congratulations, Mike! And thank you, Rob. …Aaand with about 15 minutes left, our April update is actually published during April. Let us all cavort! See you at our May meeting! March 2018: The O’Ken Show! I could not be at our March meeting, as I was attending a friend’s engagement party. So I delegated photography duty to Original Ken. He took several great pics. Not much info on the individual models, however, so let’s get right to the photos! This year’s show is in color. I’m still exploring the WordPress gallery options. Although this is a different layout, it functions the same as last month’s version: Select any preview to bring up a larger image, and arrow your way to the left or right. See you at our April meeting! I reported back in November the sad news that our local K-mart would close (and it has). I didn’t know if Mattel would continue the K-Day tradition in light of all the store closings, or whether our county’s last K-mart store would be included if it did continue. 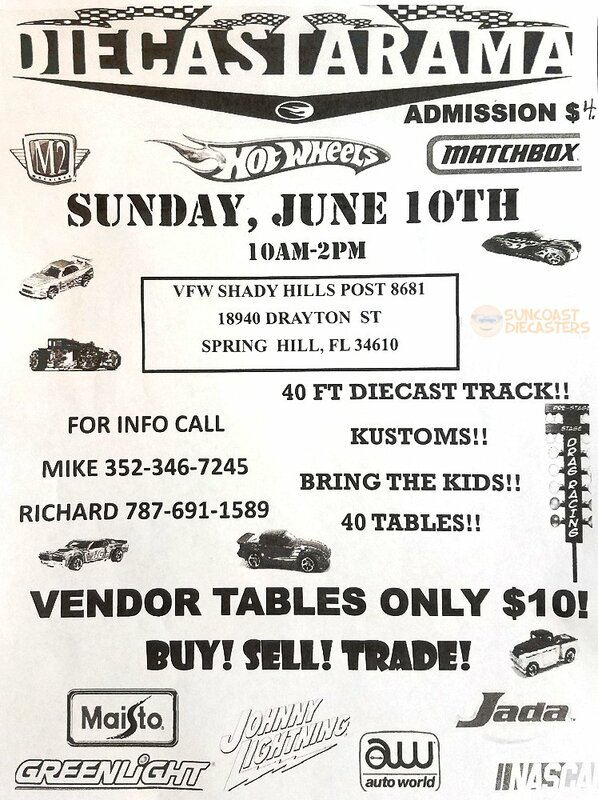 I recently received e-mails from Hot Wheels Collectors advising of the next K-Day event. Per the store list, it has in fact been moved to our last Pinellas K-mart, and the details are on our Calendar. January 2018 Update: Great Start to the New Year! You may recall that previous years’ January updates were lightweight affairs. Post-holiday wind-down, attendance was low, and few if any trades took place. This year, our January meeting was radically, wonderfully different — a good crowd, and some serious treasure-tradin’ and car-findin’!. So get to the photos! Ed was in attendance, and brought in a wonderful variety of models: Treasure Hunts, almost all in Kar Keepers; quality loose models in Jammers; packaged sets; and … the cardboard box. Matchbox ambulance, and High Speed police car. Matchbox Mayflower moving truck with opening rear doors (and without rear axle). Speaking of Kar Keepers: I told you I would, and I did. I asked around at the meeting if anyone had a Kar Keeper or Protecto Pak. Big Tractor Mike demonstrated some left-over holiday spirit and RAOK’d me with a P’Pak! Later, I secured my Milano as promised. See? The one Milano is safely MOC in the shell, while the other can be displa– THE DEATH STAR HAS CLEARED THE CARDBOARD! THE DEATH STAR HAS CLEARED THE CARDBOARD! Ken got this sweet Zee (Zylmex) school bus from BTM. Overall the package is in really nice condition, with beautiful artwork. I’d give this Zee an “A”. By the way, I was originally going to not point out the vintage price tag, as Wal-mart is quite contemporary. But then I thought about the fact that Zylmex has been gone for a while. In fact, according to the Zylmex Tribute Page, the company went out of business in 1996. As of this writing, that’s twenty-two years ago — in other words, nearly a quarter of a century. I guess that’s pretty darn close to vintage. Big Rob had a nice assortment of Johnny Lighting Lost in Space miniatures, and sold this Robot B-9 to … somebody. Seriously, neither Rob nor Ken nor myself can remember who bought this. Even so: Enjoy your recent purchase, Unknown Suncoast Diecasters Member! Mystery Collector; Are you ready for your Mystery Collector? As club photographer, I’m always taking photos of people’s treasures. But at this meeting, something unique and wonderful happened: Ken took photos of my treasures! Ken was impressed by the cars I found, and snapped photos for our club’s Facebook page. For example, from Robby, Big Rob’s son, I bought this NASCAR Stocker. Very good condition. This is the version which says “Racing Stocker” on the base. While not the exceedingly rare “Mountain Dew Stocker” version, I am nonetheless very happy with this model. Although, to be honest, I’m a Coca-Cola man myself. From Ed’s pile-o-playthings, I found three cool models. First is this Mercedes convertible by TootsieToy. This is a really good-looking casting. As you can see, they’re somewhat cartoonishly proportioned. Both have the same base, and the same construction: The one-piece engine/interior simply snaps into the body shell. Both have friction motors. The blue is gummy, and goes neither far nor fast. The red on the other hand still performs relatively well. However, quite seriously, no-one in the club has any idea where these models are from. Not even Ed, who had them in his cardboard box. So if any of you fellow collectors out there can shed any light on these mystery mobiles, please let us know in the Comments. Thanks! So, let me make this official: 2018 starts off grandly with Dual Finds of the Month(**): Ken’s classic Zee bus, and my Hot Wheels oddball unknowns. Three cheers and a tiger for us! …And, our January updated was posted with a tiny little sliver of January left! Celebratory victory dance! See you at our February meeting! So, let us get to the photos! Our Christmas bonus for 2017 came in the form of a new member. We have Original Ken and Emergency Back-up Ken, and now along with Big Tractor Mike we have a bonus Michael! He’s a friend of BTM, and brought in some handiwork. The green-&-white tractor is BTM’s; Michael fixed the wheels and axles of it for him. The silver tractor is Doug’s, and Michael cut some clear plastic sheeting to make windows for its cab. By the way, both models are 1/64th-scale. Michael also made the tanks. They were plain cardboard tubes with plastic endcaps. He painted them white, then bent thin steel rods to make the pipes. Who’s that handsome fellow hiding in there? The broad side of a cliché. This is another custom build by Doug for BTM. I don’t recall what specific type of structure it is (I’m still a-waitin’ for an informative e-mail), but even though Doug says it’s not yet finished, I can tell you it’s really quite impressively detailed. Heck, I’ll even show you! All pieces hand-cut and hand-assembled by Doug. Those square structures above Doug’s tractor are the bottom ends of these square structures. I did say it’s impressively detailed, did I not? The holiday spirit was flowing freely, as Tom RAOK’d Ken with two wonderful items. The first is this Dale Earnhardt-themed photo album. The second is this magnificent Brickyard 400 commemorative mug. This grumpy old race car I know once told me somethin’: it’s just an empty cup. See you at our January (2018!) meeting! I really have to thank the Lord for this photograph. I was going to post just the photo, no text or commentary, but it all went so well that I have to tell you about it. It was taken out on the Causeway, about mid-day with the sun behind me. I piled up some sand to form a raised surface for the props, rather than shooting “down the slope”. I found a somewhat flattish rock to set the camera on. There was no way for me to get down and accurately aim using the optical viewfinder. And of course, the sun essentially washed out the camera’s LCD preview screen, so I couldn’t tell if I was centered on the props or where the focus landed. In particular, I had no way of knowing whether the waters of the Sound provided the background I hoped they would. I was going to shoot multiple photos using different flash settings, just to see if one worked better that the others. But once I realized I was, as it were, “shooting blind” because of the sun, I simply went with the one photo, with the flash off and using only natural sunlight. I used the timer for stability, because even my lightest press on the shutter button would’ve jostled the camera on the rock. After the shutter clicked and the camera finished processing the image, I previewed the photo by cupping the camera right up to my face. I had made no adjustments to the zoom setting, other than changing from Normal to Macro because the camera was so close to the mound, so I was surprised — and concerned — when I realized the props took up only a very small portion of the total image, as if I had shot from farther back. But I knew I could not improve upon the circumstances, and headed home accepting that however the photo came out, that’s all I had to work with. Imagine my absolute delight and pleasure when, after offloading the image to my PC, finding that not only were the props very near the center, but also that the focus was just about dead-on perfect. There was actually very little I needed to do to the photograph. In fact, the single biggest change was rotating it a few degrees so the horizon was actually horizontal. I was also happy to see that the waters of the Sound fill about the middle third of the background. Otherwise, it was simply cropping it and a few other, very minor edits. Speaking of cropping, even though the props were very little of the images’ full “real estate”, even when cropped they were larger than the size I’ve standardized for our photos, so I actually had some working room for the edits. So, despite not having anywhere near the control of the set-up that I typically have for our in-meeting photos, the Lord gave me a holiday photograph which required very little hands-on effort on my part. Even that flattish rock was a miraculous provision. I hope you all have a Merry Christmas, a Happy Hanukkah, a mediocre Festivus, and a Happy New Year!